It’s your lucky day. Call it the luck of the Irish, if you will. I’m giving you, and myself, a pot of gold. We’re practically rich at this point. Think of all the things we can buy. Unlimited amounts of Ben & Jerry’s. An Endless supply of Oreos. And, peanut butter. Oh, and obviously milk. Hopefully you don’t mind double dipping. Ohhh. Even better. A bigger kitchen. That way I can invite you over to bake with me. You can be my official taste taster. You in? FINE. I see you shaking your head. You never let me have any fun. I made us edible pots of gold. We can’t spend them. BUT. We can eat them. All of them. And, you know what, that doesn’t sound too bad to me. I came up with the idea for these pot of gold cupcakes in a dream. And no, I’m not kidding. Normal people daydream about vacations or winning the lottery or having that magical storybook romance. Not me. I daydream mainly about food. Not eating it so much, but making it. When I stare off into space I’m building recipes, imagining different flavor combinations, and debating if those combinations would taste better as a cake, cookie, pie, or so on. Foodie dreams. That’s what I have. Don’t judge. It does happen to some people. I can’t be the only one. Right? 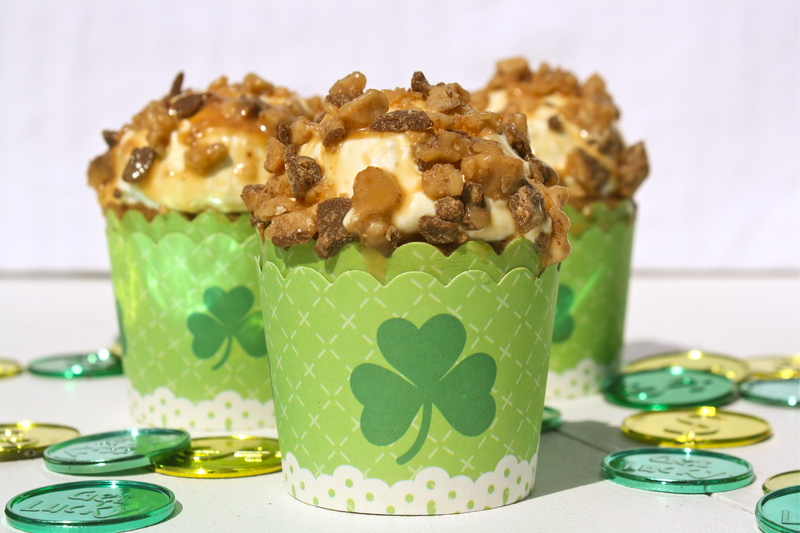 I wanted to make a cupcake that was St. Patrick’s themed, but I didn’t want it to be green or involve four-leaf clovers…there are way too many adorably indulgent desserts already with those two things. So, I started thinking. What else screams March 17th? Bailey’s Irish Cream. Tad bit predictable. Jameson Irish Whiskey. I don’t even like whiskey. Leprechauns. Would be hard to make into a dessert. Hmm. What’s related to a leprechauns? Gold. I could make gold cookies. Wait. Pots of gold. BINGO. I found a winner—keep in mind that’s basically a direct quote of my inner monologue. Your welcome for sharing my craziness. Once I had the idea of making pots of gold, the recipe just sort of fell into place. Hellllllllo caramel toffee cupcakes topped with a fluffy caramel marshmallow frosting, coated with caramel, and sprinkled generously with toffee pieces. Let’s break this down more slowly. 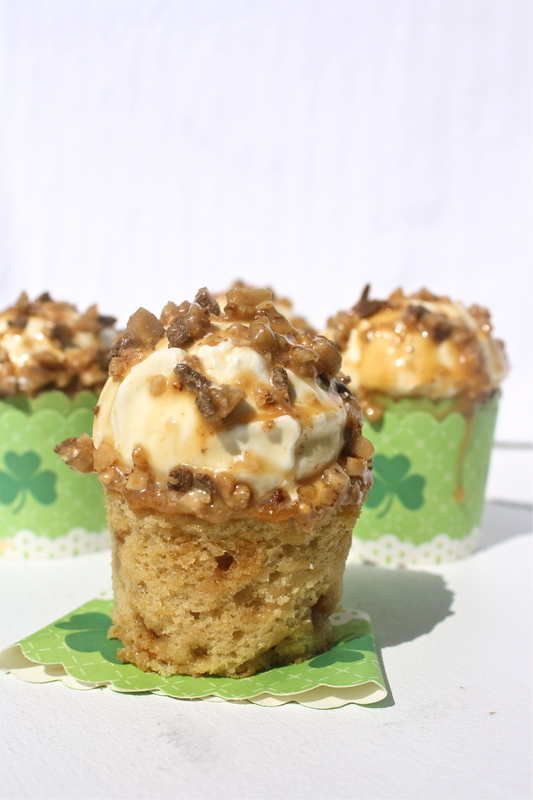 Caramel toffee cupcakes. They are ridiculously moist, soft, and caramely. 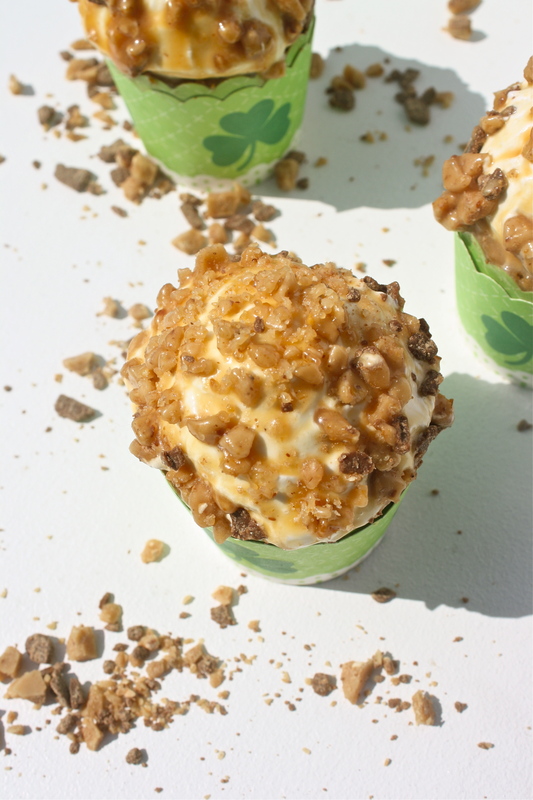 Toffee pieces are scattered throughout the cupcake, making the caramel flavoring even richer. Each cupcake is then topped with Caramel Marshmallow Frosting. This frosting tastes like a combination of cool whip and marshmallows subtly infused with hints of caramel. Yes, that is a thing. And yes, it’s to die for. Once topped with the fluffy frosting, the cupcake is dipped in a caramel bath (can we make that a thing?) and then sprinkled generously with toffee pieces aka pieces of gold. Together, as whole, this cupcake is heavenly. One thing though…if you notice, I have some chocolate pieces on top of each cupcake too. That’s because I mistakenly grabbed a bag of milk chocolate toffee pieces and not just plain toffee pieces. I noticed this as I was melting my caramel, which meant I was going to be making pots of gold filled with sparkly, and dull, gold pieces. Don’t make my mistake if you want pure pots of gold. Or, do make my mistake. The hints of chocolate are a nice surprise for the taste buds amidst all that caramel and toffee. Preheat oven to 350 degrees and line a muffin pan with cupcake liners. Set aside. In a small bowl whisk together flour, baking powder, and salt until combined. Set aside. In the bowl of a stand mixer with a paddle attachment, beat butter and both sugars together at medium-high speed until fluffy, about 2 ½ minutes. Mix in eggs, one at a time, and vanilla, until incorporated. Slowly add the dry ingredients to the wet ingredients, scraping down the sides as needed. Slowly stir in the milk, until just combined. Using a spatula, fold in the toffee bits. Fill each cupcake liner about 2/3 full, dividing the batter evenly between the cupcakes. Bake for about 23-25 minutes or until a toothpick inserted in the center comes out clean. Transfer cupcakes to a wire rack for cooling. Let cool completely before frosting, at least an hour. Before you start making the frosting, clear a space in your freezer to put the frosted cupcakes. Set a pan of water over medium heat and bring to just barely a simmer. In a heatproof bowl, beat together sugar, egg whites, water, and cream of tartar, using a handheld electric mixer on high until foamy. Set bowl over pan of simmering water, making sure the bottom of the bowl doesn’t touch the water, and beat mixture on high until frosting forms stiff peaks, about 15-20 minutes (yes, it’s an arm workout); candy thermometer should read 160 degrees. 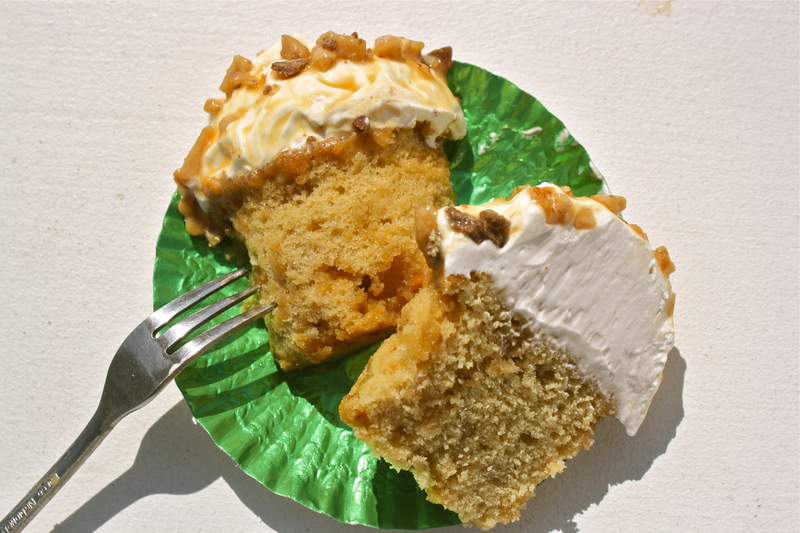 Remove from heat and beat in vanilla and caramel, about two minutes or until frosting is of a thick enough consistency. Using an ice cream scooper, scoop a ball of frosting on the top of each cupcake in the middle. Let cupcakes sit in the freezer for about 30 minutes or until frosting has set enough that you can flip the cupcakes upside down without the frosting falling off. While the frosting is setting melt caramel squares as directed on the package in a tall cup or deep bowl. Let melted caramel cool to room temperature—you want it to be cooled, but of drizzling consistency. Holding a frosted cupcake upside down, dip the cupcake into the melted caramel—allow excess caramel to drip off. Let caramel coated cupcake sit for a minute or so and then sprinkle with toffee bits—I found that if I sprinkled the cupcakes right away, some of the toffee pieces made the caramel drip off. Place cupcakes in the freezer for about 15 minutes, or until the caramel coating has slightly hardened. 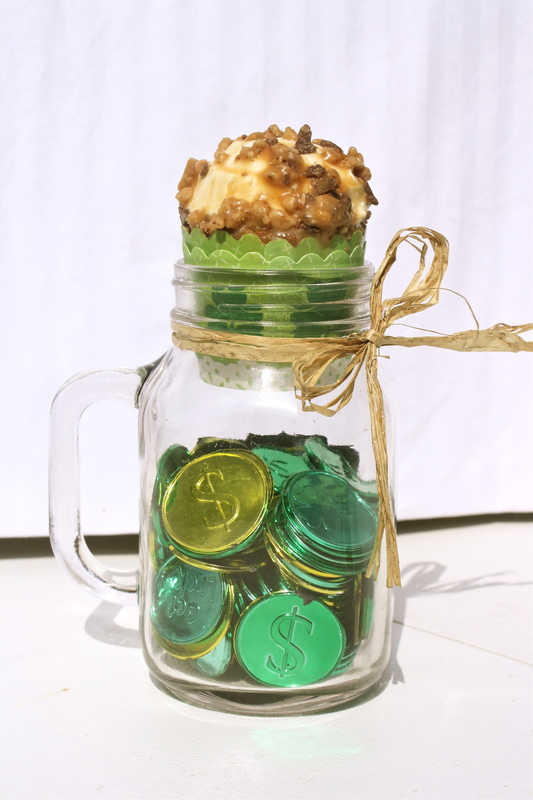 This cupcake wanted to take a picture with these gold coins. In a mason jar. With a gold bow. Such a cupcake diva. 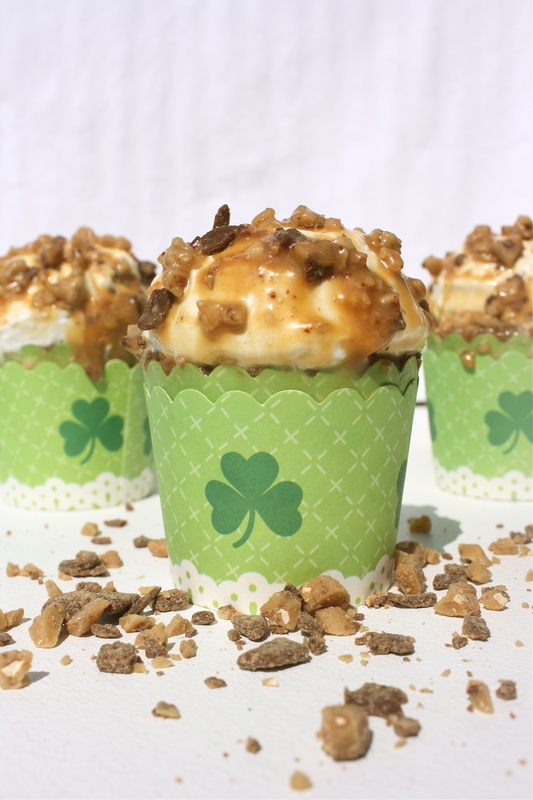 What a great dessert for St. Patrick’s Day!